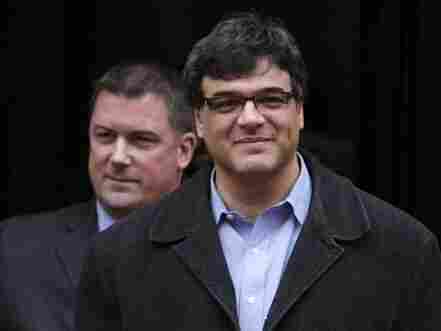 UPDATE: Former CIA Officer Pleads Guilty In Leak Case : The Two-Way John Kiriakou was accused of leaking the identity of a covert operative involved in the high value terrorist detention program and of lying to the FBI. In a plea deal, most charges were dropped. He will serve a 2 1/2 year prison sentence. Former CIA officer John Kiriakou, as expected, pleaded guilty this morning to revealing an undercover operative's identity. "Kiriakou pleaded guilty to a single count of disclosing information that identified a covert agent. ... As part of the plea deal, prosecutors dropped charges that had been filed under the World War I-era Espionage Act. They also dropped a count of making false statements. Under the plea, all sides agreed to a prison term of two and a half years." We've put the "plea agreement" and "statement of facts" online and embedded them here. Click on the titles to pop up larger versions. Former CIA officer John Kiriakou is set to plead guilty in federal court in Alexandria, Va., on Tuesday, averting a trial next month on espionage and obstruction of justice charges, according to the court docket. Kiriakou is the sixth person charged by the Obama Justice Department under the 1917 Espionage Act, and his case has been closely followed by the national security community and by the media. He's accused of leaking the identity of a covert operative involved in the high value terrorist detention program to a reporter and of lying to the FBI when agents asked him about the conduct early this year. We reported about Kiriakou in April: "The Case Of An Accused Leaker: Politics Or Justice?" Jesselyn Radack, who works on security and human rights for the nonprofit Government Accountability Project, which advocates for whistleblowers, said then that the pursuit of Kiriakou had more to do with his public comments about waterboarding, or simulated drowning of terrorism suspects, than with any real damage he did to national security. Word of the "change of plea hearing" comes only days after Judge Leonie Brinkema struck the heart of Kiriakou's defense. In a ruling made public last week, the judge said prosecutors did not need to prove Kiriakou, a CIA operative between 1990 and 2004, had intended to harm the United States by telling reporters about his covert colleagues and their role in sensitive operations. Instead, the judge said, the Justice Department need only demonstrate that Kiriakou had "reason to believe" the leaks could hurt the U.S.
Robert Trout, a lawyer for Kiriakou, told NPR in an email Monday evening that he had no comment "at this time." A spokesman for U.S. Attorney Neil MacBride in Virginia also declined comment. The case had taken a toll on Kiriakou and his wife, who also worked at the agency but who left after the criminal charges became public. He had generated broad support in the whistleblower community but the case also stoked controversy in the world of media law, after he subpoenaed a reporter and a researcher to try to get them to testify in his defense. His trial had been scheduled to begin November 26.